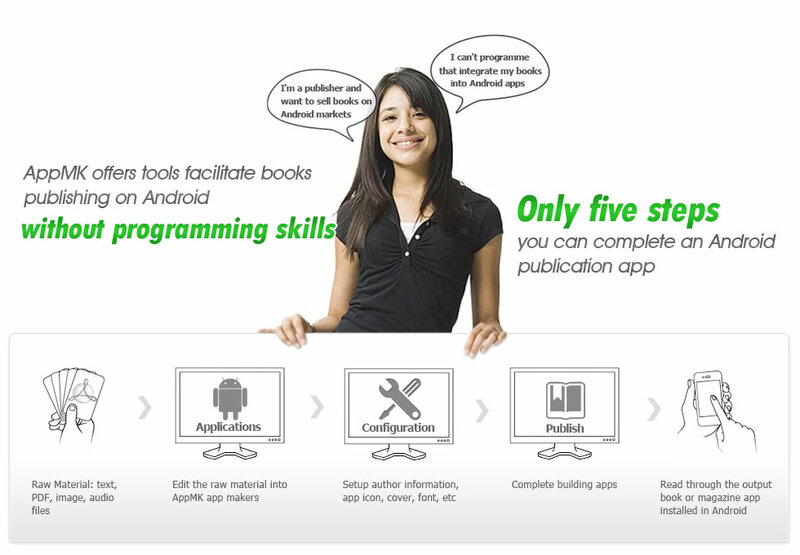 Android book app maker is the easiest tool for you to build book applications which can be sold on Android markets. It specializes in building flipping and scrolling Android book apps. The raw material is just text files. In fact, you needn’t do any programming. It can convert PDF and image files to Android magazine apps and embed audio files. The magazine on Android devices furnishes you with index, search, zoom in/out, and the interaction with writer, etc interactive functions. AppMK is committed to provide with the practical and cost-effective solutions to create apps for Android devices. We provide series of Android app makers for the content owners or Android publishers who have no programming skills. We concentrate on improving the products according to the feedback and valuable suggestions from users. We also provide service of customization. If you need special function, please contact us, we give you a perfect solution which meets all the needs at an affordable price. 1. Can I flip like reading realistic paper books? 2. Encrypt book content in case extracting? 3. Why the Admob ads can't display?